I’m no stranger to odd dating sims. In the past, I’ve dated pigeons and even had a homosexual relationship with a piece of meat—so dating sushi seems right up my alley. Love! Sushi Rangers -Choose your target (sushi? )!- is an iOS/Android Otome game—i.e., a game where you play as a girl surrounded by a group of pretty boys who are all potential love interests. Only, instead of being pretty boys, in Love! Sushi Rangers they are sushi that turn into pretty boys. The girl who you play as—who I lovingly named “Kotaku”—is the daughter of a famous sushi chef. One day, without warning, her father announces that he’s going on a world tour and she’ll have to take over the family restaurant for him. The problem is, she doesn’t know how to make high class sushi nor manage a restaurant. But just when she thinks she’ll have to close down, six pieces of sushi turn into pretty boys, saying they are here to help. There is Maguro (tuna), a tsundere and the most popular of the group; Salmon, Maguro’s rival; Ikura, Salmon’s little brother; Tamago (egg), Ikura’s best friend; as well as Ebi (shrimp) and avocado. 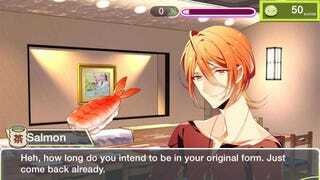 At the end of the prologue, you choose between pursuing Maguro, Salmon, Ikura, or Tamago. As you go through the story of your choice, you will occasionally come across multiple choice questions. Based on how you answer, you can gain affection points with the boy you are trying to woo. Overall, it’s a pretty run-of-the-mill dating sim outside of its crazy setup. You help the boy of your choice overcome his problems and the two of you fall in love in the process. And while it's more than a little cliché, for what it is, it isn’t terrible—until you start talking about the microtransaction system anyway. Indeed, this is a freemium dating sim. You start the game with 100 units of game currency called “koyon.” You then pay 10 koyon to see each new scene (and 50 if you want to save any of the special pictures you come across). When you run out of koyon, you can no longer continue playing the game—that is unless you get more koyon of course. The easiest way to get more koyon is to buy it. Koyon costs $0.99 for 50 at its cheapest—but you can of course buy much larger amounts that give a bonus of koyon (up to $39.99 for 5300 koyon). You can also get koyon by watching commercials or signing up for trials of various apps and services. But if you don’t want to go through all that, you can just play the waiting game. Every day at 4am, you will get 20 koyon—granting you another two or three minutes of the game. All in all, Love! Sushi Rangers is a rather cliché otome game story with a funny setup. And while I might have even been willing to buy the whole game for a dollar or two for the sheer novelty of it, I’m not keen on paying for it a piece at a time—at a potential price of far more than a couple of dollars. Still, if you are looking for a female dating sim that is available in English and don’t mind playing it for only a minute each day, you may want to give Love! Sushi Rangers -Choose your target (sushi? )!- a try. Love! Sushi Rangers -Choose your target (sushi? )!- is currently available for iOS and Android and can be downloaded from iTunes or Google Play. Big thanks to Dan Feit for bringing this to our attention.